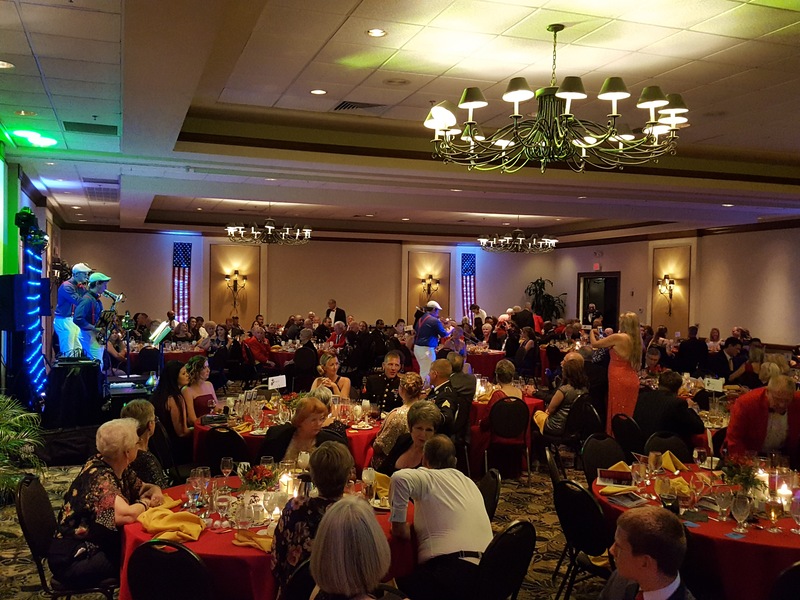 The 2019 Marine Corps Birthday Ball will be held on Saturday, November 2nd, 2019 at Turkey Creek Clubhouse. Tickets will be $40 per ticket or $280 for a table of 8. Retired LtGen Bergman, now in Congress representing the First District of Michigan, will be returning as our Guest of Honor. Meals will once again be provided by Chef Brothers and the band Groove 41 will return for a repeat performance. We will begin taking reservations in late March. I expect we will get reservations for over 300 seats within a couple of weeks. We will be asking that all payments are made within 60 days of the reservation. We will also begin selling ads for our program. Advertisers and sponsors will be featured in our program book and on signage. Proceeds of ads and sponsorships will help pay our expenses so please reach out to those you know who may help us. Photos of the Ball - They're Here!! The photographer this year was Chris Robinson. He captured several hundred pictures and they are now available on our site. Go to the 2018 Birthday Ball page and you'll find the links to three photo albums. Enjoy the photos. The Committee is already working on next years' event. We mentioned recently that reservations would go quickly for the annual Birthday Ball to be held on November 10th. You all did not disappoint this year. As of April 26th, we had to halt online ticket sales as our reservations topped 300 guests. Now this means people have contacted us and told us they are coming. Some have paid and some have not. We will set a deadline for people to pay and beyond that deadline, we will remove reservations for unpaid seats and we will add reservations from our Waiting List. There are also other conflicts that cause people to cancel their reservations, so it is important to sign up while you can. You can get on our Waiting List either on our website or by calling Jim Yakubsin 352-222-8837. Just to give everyone a quick update: we had intended to get tickets and ads rolling in May. But we have received so many phone calls and emails from people letting us know they want tickets for this year's event. The list is now over 250. So we have already produced ad forms and auction gift solicitation forms. We'll add those soon to this site. I am still creating the mechanisms to sell ball tickets through this site, which just underwent some major changes. I am switching out the credit card processor to make it easier for you. As soon as that is done, and the tickets are all set up online, I will make those public and put the word out to everyone. FROM THE WEBMASTER: If you have visited the site before, you'll notice it looks like a completely different site. Well, it does look very different but underneath the hood it is still the same site. WHY? As technology rolls ahead, many features are at our disposal. But the coding that made up our site was older and will not support some of the new features. So, I had some choices and this was the design I went for. Most of the improvements are things I will be able to use and you will not see them directly. It will be good to have the options. With Memorial Day just three months away, it is a good time to think about honoring the memory of a special veteran in your life with a commemorative brick that would be placed at the veterans memorial in Alachua at City Hall. These are special bricks designed to withstand time. They are engraved with the name and message you request. It is a timeless gift for that veteran, one that is tangible and one that you and others can visit for years to come. The cost of the brick is $110. You get three lines of text. Brick forms and more information can be obtained from Jim Yakubsin at 352-222-8837. We hope everyone is having a good start to 2018. Commandant Jim Yakubsin had a much-needed knee surgery and he is currently recovering. We wish him a speedy recovery. Elections are next month for the Board officers - Commandant, Senior Vice Commandant, Junior Vice Commandant and Judge Advocate. At the January general meeting we will allow time for anyone to announce their intention to run for office. Nominations and Elections will be held at the February general meeting. The Annual Veteran Standdown is this week (January 17th.) Anyone wanting to assist, just contact any detachment officer. The NHRA Gatornationals will be here in March. We always have some volunteers who can work for Security and it will earn some money for the detachment (like $100 per day.) If you are interested contact Scott DuPree by email at ssgtd@cox.net. On Saturday 4 November 2017 we celebrated the 242nd birthday of the United States Marine Corps. The room was sold out to 275 guests as we held the party at the Best Western Gateway Grand in Gainesville. After a traditional ceremony led by Sandra Torres-Pintos, we had dinner followed by a tribute to World War I veterans and a dedication of the ball to Marine Bill Cummings, who wanted to attend but passed on October 19, 2017. Our Guest of Honor was Colonel William F. "Lin" Williams III (USMC, Ret) from Lake City. His talk was about Marine leadership and living up to the Marine Corps legacy. Linda Yakubsin was presented with the Jim Yakubsin Vision Award and Marine Bob Wright was awarded the 2017 Marine of the Year. Our Master of Ceremonies for the evening was TV 20's Dave Snyder. We appreciate his continuing support for our group and veteran groups in the community. Perhaps the biggest difference this year was the entertainment. Those Guys is a band out of Orlando that play a variety of music. They were exciting, engaging, energetic and had the dance floor crowded. It was a grand evening. We look forward to hitting this high standard next year on November 10th.